Students and faculty study the future of urban waters in Philadelphia and Mumbai. On a brisk day last December, students in the course Liquid Histories and Floating Archives walked along a stretch of the Schuylkill River, as they had done each week of the fall semester. 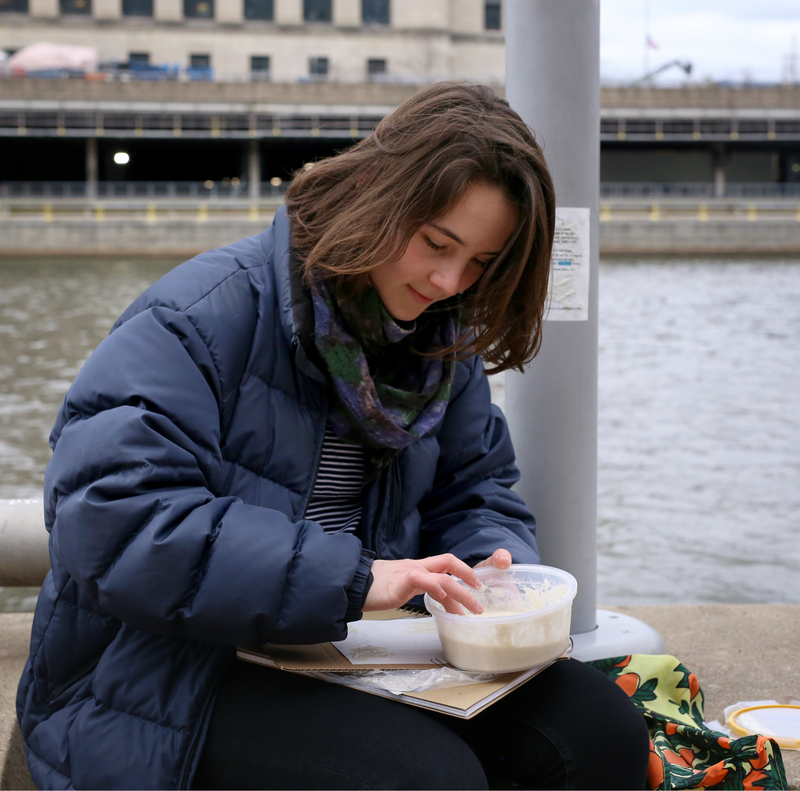 On this particular day, they were applying sheets of paper to concrete walls, metal poles, and railings at Schuylkill Banks Park as part of a final project by urban studies major Lucy Corlett, C’20. Along with a simple line drawing of the river, each paper contained the first and last stanzas of a poem called “Lines Written on Leaving Philadelphia,” composed in 1824 by the 19th-century Irish poet Thomas Moore. Corlett discovered the poem in an online archive documenting the history of Philadelphia’s watershed. The multi-disciplinary Liquid Histories course, taught by Bethany Wiggin, Associate Professor of German and Founding Director of the Penn Program in Environmental Humanities, examined how sea-level rise in a time of climate change is transforming urban environments. “In the class we explored the way local knowledge shapes how we understand the global problem of sea-level rise from our vantage point in Philadelphia,” says Wiggin. “We read about our urban waterways, their history and future, and we walked alongside them to experience them and to have those encounters shape how we approached more analytic course materials.” The students reflected on what they had learned in a collaborative blog post. Liquid Histories was one part of a larger undertaking called Rising Waters: Philadelphia and Mumbai, an ethnographic and historical research project exploring river and coastal cities, led by Wiggin and Nikhil Anand, Assistant Professor of Anthropology. Anand taught the first Rising Waters undergraduate course at Penn in spring 2018, and co-taught the second in Mumbai last fall at the Tata Institute of Social Sciences (TISS). Rising Waters engages institutionally based student research fellows in both cities over a three-year period. It is supported by Penn Arts and Sciences’ Making a Difference in Diverse Communities initiative, which assembles interdisciplinary teams of faculty members to work with undergraduates in underserved communities to explore issues of inequality and diversity. In January, Wiggin, Anand, and six undergraduate Rising Waters fellows traveled to Mumbai for a Winter Intensive seminar with faculty and six student counterparts at TISS. Philadelphia and Mumbai share a history of industrial development on drained tidal wetlands that have been heavily settled by energy and port infrastructures. As the climate warms, rising waters and extreme weather events threaten the infrastructure, exacerbate social inequalities, and degrade remaining natural areas. Rising Waters participants hope to imagine alternative visions for water use, conservation, and equity in the two cities. The Mumbai intensive had three main components: a series of presentations by thinkers, artists, and activists working with urban waters in different contexts; two days of student workshops and activities, including a field trip to the east coast of Mumbai, where most of the city’s port infrastructure historically has been; and a series of public events, including an outdoor exhibition of photographs by Sudharak Olwe exploring urban waterscapes and unequal access to water in Mumbai. The students’ projects fell roughly into three clusters. One cluster looked at riverscapes; another at water rights and sanitation, including pollution from petrochemicals; and the third explored new ways of managing water resources—such as rainwater harvesting, revitalizing canals, and redevelopment of port areas. Public engagement and dissemination of research are crucial parts of Rising Waters. Students in both cities interacted with practitioners from various disciplines, including a residency at Penn by climate journalist Eric Holthaus. Wiggin and Anand will present the research findings in publications and at academic conferences in history, anthropology, and environmental humanities. Student projects will be posted online, and plans are in the works for both virtual and “real” river tours and exhibits meant to engage the public. By focusing on two vastly different cities, Rising Waters: Philadelphia and Mumbai seeks to envision a range of new approaches to urban waters and adaptations to climate change that can be applied to other locations.